Got some older Linkwood for your reading pleasure today. As with most of them, it is an interesting distillery I didn’t really know enough about. It’s owned by Diageo and actually I have visited it, briefly sitting in the car park. It doesn’t have a visitor’s centre, or really many official bottlings. Mostly because they need it for the blends. Luckily, there does seem to be a good availability with the independent bottlers. So, the interesting part. There are 2 distilleries at Linkwood. Not unlike Clynelish and Brora (Now I’ve got your attention). In 1971 a second distillery was built and called ‘Linkwood B.’ It was not an exact replica of the old ‘Linkwood A’ because Linkwood A had worm tub condensers. They closed Linkwood A in 1985, but kept it as an experimental site doing occasional distillations. It also ran from 1990-2012 a few months a year. I think the old Linkwood A has now been demolished and a new part of Linkwood built, but details are hazy. 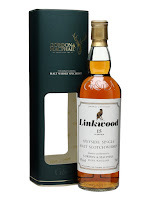 Now, I not sure Diageo would have wanted to use the experimental spirit distilled around 1985 at Linkwood A, as it would be different in character to ‘normal’ Linkwood B, possibly they would have sold it. Maybe to an independent bottler? Who knows? Nose: Intense sherry nose. Very appley, menthol, creamy oak, sweet red apple, sharp green apple, apple crumble, bit of strawberry, brown sugar, vanilla, lots of honey, bit of pineapple, herbal note- Mint, olive oil?, sweet sherry, oaky tannins, coffee, bit of fruitcake. A little bit of heat. Taste: Intense sweetness. Sweet red apple, sharp green apple, sharp unripe pear, bit of cranberry, brown sugar, aged sweet sherry, lots of oak interaction- Old wood and sweet oak, drying spices build, cream, fruitcake. Finish: Medium length. Drying sweet oaky spices fade, then sweet sherry kick to end. A lovely Speyside malt. Enough character to separate it from the 50 or so other Speyside distilleries. Nose: Heavy, intense and rich. Scented candles, candle wax, struck match, elderflower, camomile and jasmine, honey and vanilla, exotic spice- Saffron. Huge waves of perfume, good quality vanilla ice cream, molasses, brown sugar, brandy, rum. Water: More biscuity, Jaffa cakes, some lighter citrus notes- Orange, lemon. More floral- Grassy/hay note, herbs and spices, dried banana. Taste: Big, explosive sweetness. Pineapple, peach, brown sugar. A lovely building waxiness with a good amount of oaky spice. An incredible mouthfeel with an oiliness and creaminess. Water: Honey, lots of brown sugar, sharp citrus fruit too- Red apple and lemon, some spice- Pepper and some ginger. Developing spicy oakiness with tannins, orange, going more drying with spiced dry fruit- Raisin, dry cinnamon, dry oak. Finish: Medium/Long length. Coffee with exotically spiced fruit tea. With water, you get brown sugar. Distilled November 1985, bottled 2012. 27 years old, cask 4539 a refill Hogshead. I like to think this was one of those experimental distillations from Linkwood A. To me, this has notes of worm tub distillate. I think Diageo really missed a trick here. 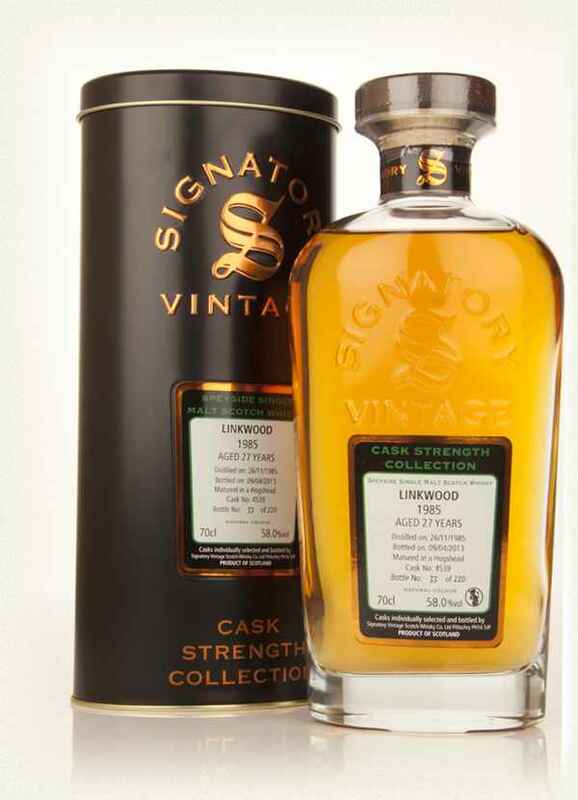 They could have renamed Linkwood A to Clynora or something and started releasing it with slowly increasing prices like Brora or Port Ellen (although those are peated). Hell, I would buy it.